Has anyone had much luck with this? 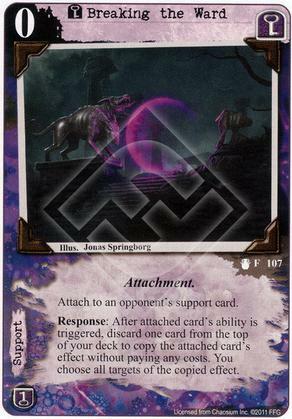 I like the idea of attaching it to any support card my opponent uses that has some ability that benefits them, including Festival, Temple, even the brief use of Khopesh. But, I dislike having cards dependent on my opponent, or that they may use support cards that work by leaving play, such as Flooded Vaults or Forbidden Knowledge. Nope, and honestly, I've never tried. Yog has so many good cards that I don't want to put one in that is as conditional as this.